Long ago, a clan of hardy microbes called cyanobacteria helped terraform the lifeless Earth into a vibrant biosphere. Today, the very same critters could be the key to colonizing Mars. Plants are going to have a tough time on the Red Planet’s hostile surface, but cyanobacteria have coped with extreme environments for eons. A paper led by astrobiologist Lynn Rothschild of NASA’s Ames Research Institute argues that we can harness these tiny photosynthesis machines to produce many of the resources we’ll need to survive, from food and oxygen to metals and medicine. Here are all the ways cyanobacteria can help us build a Martian colony. In science fiction, we find humans harvesting fields of wheat under terraformed Martian skies and growing rows of potatoes inside climate-controlled Habs. But in reality, growing any plants on Mars is going to be a challenge, because the Martian soil lacks some key ingredients. First and foremost, there isn’t much nitrogen. Plants require lots of the stuff, and they need it in one of two chemical forms: ammonia, NH3, or nitrate, NO3. Most of the nitrogen on Mars is locked up as N2 gas in the atmosphere, but as far as we can tell the soil is pretty nitrogen poor. (The Curiosity rover got its first whiff of biologically-useful nitrogen on Mars this past March). This also happens to be the situation on Earth, but we have a solution: Microbes. Cyanobacteria are among a diverse group of nitrogen-fixers, bugs that deploy specialized enzymes to pull N2 out of the air and convert it into ammonia. On Earth, nitrogen fixers live symbiotically within plant roots, feeding their hosts nutrients in exchange for sugar. and colleagues argue that we could likewise harness cyanobacteria to extract all the fertilizer we’ll need from the Martian atmosphere. Beyond nitrogen, there’s a laundry list of other nutrients plants and humans need to stay healthy — phosphorus, magnesium, potassium, calcium, zinc, iron and so forth. Most of these elements can be found in the basaltic rocks that cover the Martian surface, and cyanobacteria can help us extract them. Certain species secrete enzymes that literally digest minerals, liberating the nutrients within. In fact, it was this metabolic capacity that probably helped ancient cyanobacteria colonize the barren surface of the Earth. Cyanobacteria are proven nutrient miners, but it’s possible we can push them further than evolution already has. With a little genetic tinkering, we may be able to engineer cyanobacteria capable of extracting all sorts of useful metals from rocks. We already use microbes in copper and gold mining operations on Earth, and the asteroid mining company Deep Space Industries is busy engineering bugs that can chow through space rocks and poop out platinum. The Great Martian Gold Rush won’t be led pioneers with pickaxes, but by scientists with genetically modified bacteria. If Martian settlers have to bring all of their food from Earth, it’ll add a tremendous amount of weight, rocket fuel, and money to the cost of the trip. For a Martian colony to be sustainable, we’re going to need food that was grown on Mars. But it won’t necessarily be plants. Sure, space lettuce is all the rage on the ISS this year, but on Mars, it makes a lot more sense for colonists to eat green microbes. Mars only receives about 44% of the sunlight that Earth does, so we’ll need our crops to be as energy-efficient as possible. Study after study has shown that cyanobacteria are better solar collectors than plants, converting a larger percentage of incoming photons into calories. What’s more, by culturing bacteria in environmentally-controlled bioreactors, we can optimize their growth to a degree simply not possible with leafy greens. 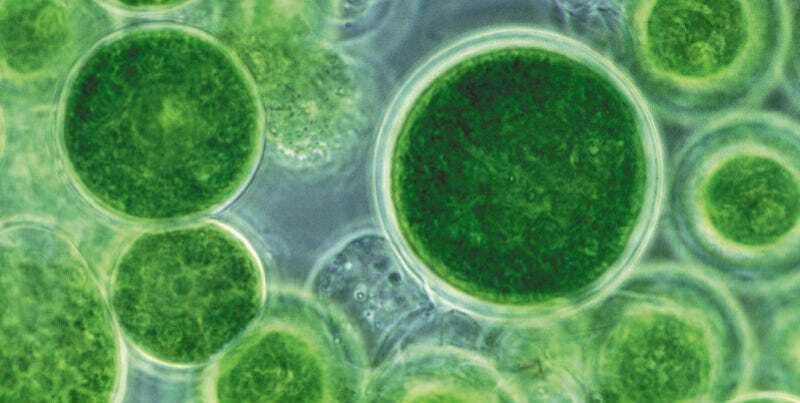 If eating microbes for lunch sounds slightly weird, keep in mind that cyanobacteria are already a popular food supplement on Earth. Ever heard of Spirulina? The blue-green powder that’s all the rage at health food stores and hipster juice bars is a cyanobacteria belonging to the genus Arthrospira. Arthrospira has a high protein content and is a nearly complete nutritional source, lacking only in vitamin C and certain essential oils. Again, with a little genetic modification, we might be able to perfect Arthrospira’s nutrient profile — and its flavor. Pumpkin spice Spirulina bars might be just what our brave Martian colonists need to feel at home. The thin Martian atmosphere is virtually oxygen-free: 0.13% O2, compared with 21% on Earth. Obviously, this is less than ideal. Photosynthesis — that amazing biochemical pathway that turns sunlight into sugar — also generates O2 as a waste product. And, guess what? By capturing and converting solar energy more efficiently than plants, cyanobacteria also end up producing more oxygen waste. “Cyanobacteria are very efficient O2 producers,” Rothschild and her colleagues write. “Whereas trees release about 2.5–11 tons of O2 per hectare per year, industrial cultivation in open ponds of Arthrospira species in Southeastern California release about 16.8 tons of O2 per hectare per year.” The researchers note that in a bioreactor system optimized for temperature, nutrient flow rates, cell densities and illumination, O2 production could be dramatically increased. Rothschild and her colleagues envision collecting this O2 and channeling it into our life support systems, all the while scrubbing out the CO2 we exhale and feeding back to the bioreactor. On Mars, the circle of life will be driven by flow valves. Even if you personally don’t want to eat bacteria bars for breakfast, lunch and dinner, you can feed ‘em to your rover. Remember those handy nitrogen fixing enzymes cyanboacteria use to turn atmosphere into fertilizer? When there isn’t enough nitrogen kicking around, the enzymes get confused and grab hydrogen instead, converting it into H2 — otherwise known as rocket fuel. It’s unclear whether cyanobacteria could be coaxed into producing useful amounts of the stuff, but it’s certainly a question ripe for exploration. Rocket fuel aside, cyanobacteria produce a wide range of oils that can be collected and refined into biofuels. Indeed, algae-based biofuels are so efficient that the Department of Energy reckons algae could be running any machine that guzzles diesel today. Even if we don’t want to burn cyanobacteria directly, we can use them as feedstock for yeast, which produce another popular biofuel — ethanol. One way or another, it seems likely that the first expeditions into Valles Marineres and up Olympic Mons will run on bacteria. Oh, and the best part about burning fuel on Mars? It’s so damn cold we don’t need to worry about greenhouse gases at all. Bring ‘em on. If we want to make it on Mars long-term, we’re going to need to think beyond basic life support. Eventually, human settlers will need all sorts of synthetic materials, supplements, and medicines. Could microbes be the answer? A quick glance at the biotech industry on Earth suggests they might be. We already pack E.coli full of the genes needed to produce everything from cosmetic ingredients to antibiotics and cancer-fighting drugs. Likewise, some researchers think we can use cyanobacteria to generate all sorts useful products on Mars, including drugs, bioplastics and building materials. “The ability of cyanobacteria to produce organic material from Martian resources, coupled to our increasing abilities in metabolic engineering, make it possible to consider many other applications ranging from performing basic life support functions to generating comfort products,” Rothschild and colleagues write. There researchers acknowledge that there’s still a lot of basic science to do on this front. But if one thing’s clear, it’s that our blue-green microbial friends have the potential to be much, much more than a smoothie supplement. I know what you’re thinking at this point. Algae bars? For the rest of my life? Weren’t those poor suckers on the Battlestar Galactica miserable? Screenshot of the space garden in the movie Sunshine. Yes, but remember, those humans were also being chased across the Galaxy by bloodthirsty Cylons. More to the point: Getting the bulk of our nutrition and life support from cyanobacteria doesn’t mean we’re going to leave plants behind. Time and again, science has proclaimed the psychological benefits of growing leafy greens, and for that reason alone, it’s important we bring plants to Mars. Plants will probably make a small caloric contribution to life on Mars, but if they keep our brave settlers from going batshit, they’re worth it. Putting the first humans on Mars will be a major milestone, but keeping them alive could be one of the greatest technological challenges we’ve ever faced. Throughout their billions of years on Earth, cyanobacteria have proven themselves expert resource extractors, terraformers, and most importantly, survivors. Perhaps it’s time we offer them a challenge worthy of their skill. Verseux, C., Baqué, M., Lehto, K., de Vera, J.P., Rothschild, L.J., and Billi, D. (2015). Sustainable life support on Mars – the potential roles of cyanobacteria. International Journal of Astrobiology, pp.1-28. Dahlgren, R., Shoji, S.& Nanzyo, M. (1993). Mineralogical characteristics of volcanic ash soils. In Volcanic Ash Soils – Genesis, Properties and Utilization, ed. Shoji, S. & Nanzyo, M., pp. 101–143. Elsevier Science Ltd, Amsterdam.